Extensions or additions are an excellent way of increasing your living space without having to re-build your existing home. Bushewood Building Company provides a wide range of extension services to homeowners. Our capabilities can only be limited by your imagination. Home extensions, just like the construction of a new building, should be carried out by qualified and licensed contractors. You need permits for renovations that alter the shape or structure of your home, and failing to get the required permits could land you in trouble with your local council. Your safety and the structural stability of your house could also be undermined by extension projects. 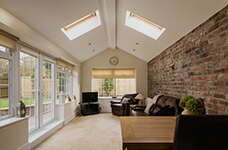 It is therefore important that you engage skilled and highly trained construction specialists to carry out any interior or exterior extensions to your home. The practicality of your extension project is the first thing you should consider when planning for additions. A feasible extension project is one that adds to the value of your home and is more economical in the long run. You should also consider any disruption that the project is likely to cause, such as the need for temporary shelter during the works. Great extensions blend in seamlessly with your existing home design and they make use of existing materials for continuity. On the other hand, poorly executed extensions degrade the aesthetic value of your home, and they can also interfere with the functionality of the house. This is why you must ensure that you involve extension specialists like Bushewood Builders to assess and execute the project. Some extensions such as storey additions can be more expensive and complex compared to rear extensions. Besides the building costs, you are also required to work with building designers and architects to draw detailed plans for your home extensions. It is therefore essential that you set sufficient funds aside to ensure that the project runs smoothly from the start to completion without any delays. Talk to our expert building and construction contractors today and let us know how we can help with your home extension projects.